ALMOND BASIL PESTO — Almonds take the place of pine nuts in this easy-to-make, traditional pesto recipes. Perfect for pasta, pizza, grilled meats and more! If I had to choose a favorite herb to grown in my garden, it would have to be basil. 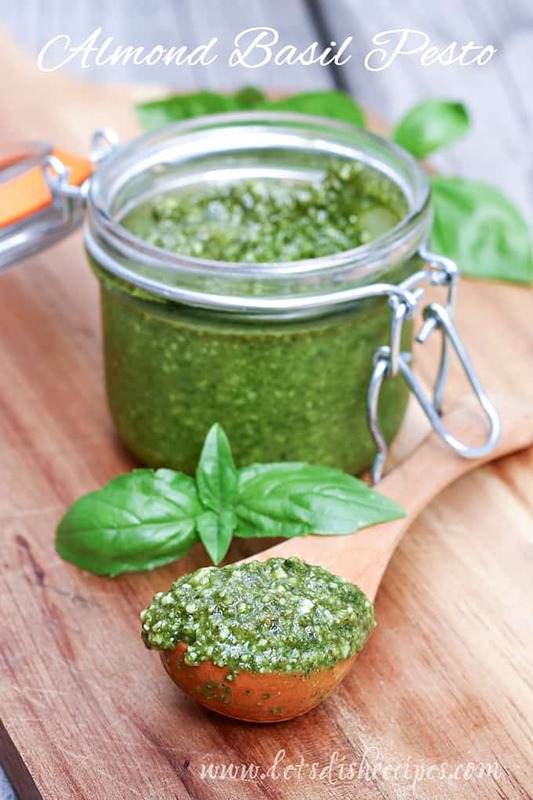 And one of my favorite things to make with fresh basil is this Almond Basil Pesto. I often find myself with an over-abundance of fresh basil about this time of year, and that’s when I like to whip up a batch of fresh pesto. 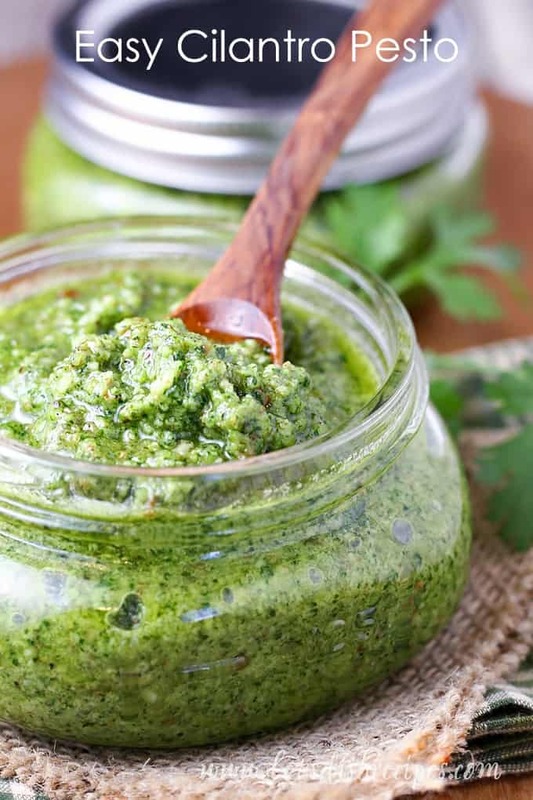 Pesto is so versatile! 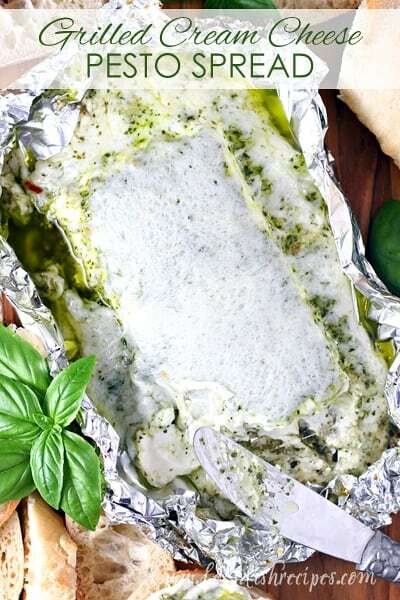 You can use it as a sandwich spread or pizza sauce, and of course it’s amazing on pasta or grilled chicken. I’ve had great success freezing pesto too. I put it in small plastic containers and enjoy fresh basil all winter long. 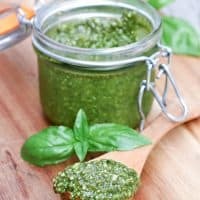 Traditionally pesto is made with pine nuts, but I usually use almonds, since that’s what I’m most likely to have on hand, and they tend to be a bit less expensive. But you can certainly substitute pine nuts in this recipe if you’re a pesto purist! Either way, you’ll have a fresh, delicious pesto on your hands, with unlimited possibilities for creating delicious pesto inspired dishes. Almonds take the place of pine nuts in this easy-to-make, traditional pesto recipes. Perfect for pasta, pizza, grilled meats and more! 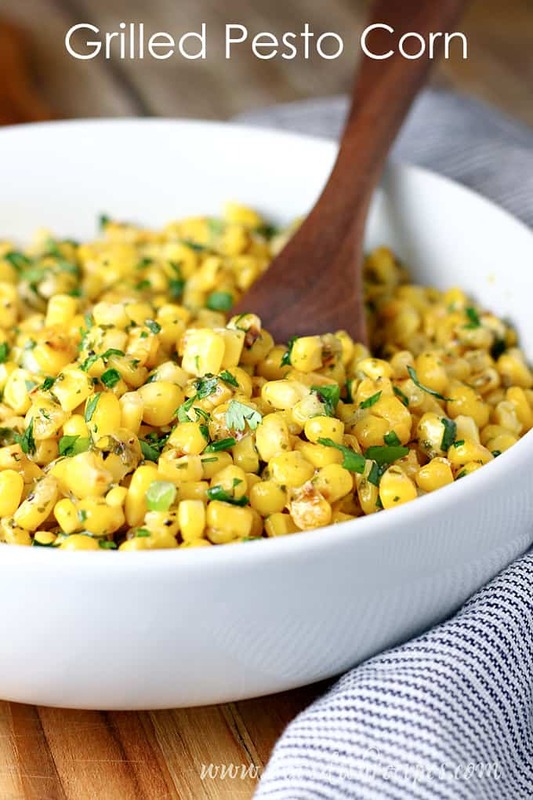 Combine the basil, garlic, almonds and Parmesan cheese in a food processor and pulse a few times, until coarsely chopped. Store in an air-tight container and refrigerate for up to one week, or freeze for up to three months. Since I’m obsessed with cilantro these days, I substituted cilantro for the basil and it was perfect!